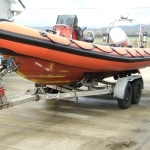 Lencraft offer a full retube facility for all makes of rib. 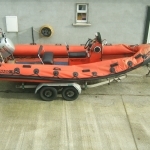 We have been designing and building ribs for over 20 years and we are the leading tube manufacturer in Ireland. Retubing a rib brings new life in to your old boat, it really can add thousands to the value of your pride and joy. In the past we have retubed everything from Tornado, Humber, Delta, Narwhal plus many many more. We use only the very best Hypalon material on the market. Gives us call now and we can quote you for a complete retube.